Adr1ft is out at the end of this month and Phil says it’s excellent and didn’t even make him throw up once. How do you go about putting something like this together? We sat down with Adam Orth, co-founder of Three One Zero, the company behind the space exploration and try-not-to-suffocate-em-up and asked him the differences between VR and non-VR development. Perhaps unsurprisingly, it’s all-new for everyone involved. Do read our Adr1ft preview for more info about one of the most highly-anticipated VR games. “We don’t know everything, it’s a lot of fumbling around in the dark. It’s exciting,” explains Orth. “because as a game developer making stuff in VR is basically like starting all over again.” This comes down to even the basics not being developed yet. Since the release of Doom we’ve known how to do first-person views, the basics of a puzzle with a mouse and keyboard even longer – none of that is true in the realms of motion control, headsets and touch pads. “It’s like everyone knows how to reload a weapon and move through a door or pick up something in a video game, done it for decades, and you try and make it cool and different in your own way but it’s essentially the same thing over and over again. Once you put those things in VR you have to re think that whole thing from the ground up.” says Orth. In that respect, we asked if he thinks that new experiences are the main draw for the VR audience. “We hope so, I can only speak on our game. I mean, we’re working on another game right now, but yeah we totally saw and understood that the experience could be new and different and we totally went for it.” With a tease like that, we of course asked if there was anything more he could say about it. 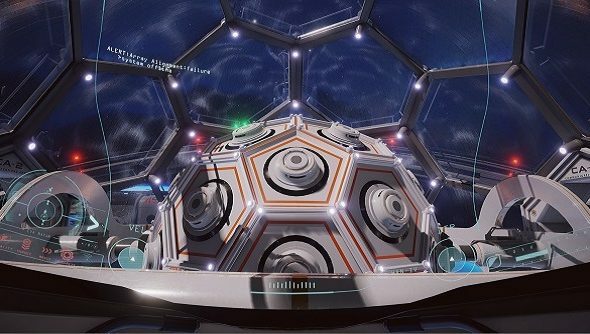 Sadly, the only thing Orth would give us was the fact they’re making it and it’s VR only – versus Adr1ft’s ability to run on a standard monitor if you want. Adr1ft is out in just a few weeks on the 28th of March. It’s neither VR-exclusive nor will it be Oculus exclusive for long, so no matter your tech you should be able to have a play. Are you looking forward to it? Let us know below.